Thanks a ton to all my blogger friends who welcomed me back in my last post but am still at home with parents and family. Though it’s been long that am here but am not complaining, and I guess no one in my position would have complained too. After taking care of an over active baby and a maddening schedule this stay at Baper bari (father house) is like a breath of fresh air to me. Here I can wake up late and once I decide to leave the bed I can again laze around with my morning Cuppa, can eat great food cooked by Maa, can spend time with friends and I can do all these without ever worrying about the baby as I know he is in good care of his Didan (grandmother). Works are there and sometimes it include lot of travel but coming back to family and steaming hot comfort food always refresh my tired soul. And the cherry on the cake is Hubby is also away on another abroad trip so this elongated stay comes without any guilt pang….Do I need more reasons to be on the ninth cloud? Am going to enjoy this stint some more as one important work of mine is still pending. Though everyday am eating great food but Cooking has taken a back seat and am only entering the kitchen to cook on some special request from younger brother. Today after a couple of failure attempts finally I had successfully baked my first yeast bread and watching the dough inflate I literally jumped like a little kid. Yesterday I made these besan ka cheela or savory pancakes made with gram flour for breakfast. This is a very common breakfast item at our household and parents liked it very much as well. Gram flour or chickpea flour contains more protein compared to other flours and is gluten free. This is also known for its anti-diabetic properties. It is an ancient item in beauty treatment mostly used as an alternative to soap to cleanse face and body. 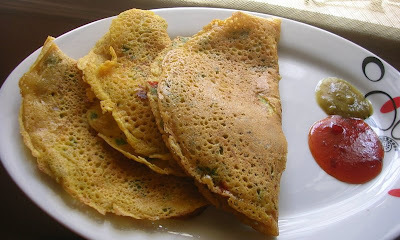 Cheela or chila is a soft pancake very common in northern part of India. Apart from Besan, cheelas are also made with yellow lentils. These are very light and could be made in a jiffy. Being the vegetable lover I am I always add very finely shredded veggies and fry them in non stick pans. Here is the recipe. Except water put everything in a big bowl. Add water to make a thin batter like pancake (approximately 11/4 cup). Check the seasoning. Heat a non stick pan and grease with few drops of oil. Pour a ladleful of the batter and swirl the pan to coat the bottom of the pan. Cover and cook on low for 30 second or till the sides of the pancake leave the sides. Pour few more drops of oil at the sides and cook on both sides till lightly golden brown. Serve hot with ketchup or any chutney of your preference. I sometimes enjoy it with leftover coconut chatni and that tastes heavenly. savory tomato chutney (recipe coming soon) tastes heavenly with this. Besan cheelaTastes great with some gravy dish too. Here is another version of cheela made by Sandeepa. There is no place like maternal home to be pampered and fussed over.The besan pancakes look delicious.Enjoy your vacation to the fullest. Hope u had a great time at mom's place..Glad to see u back dear Sayantani...Cheela looks fabulous, do send to my pancakes event dear..I'll be happy to get ur entry..
Great recipe!! 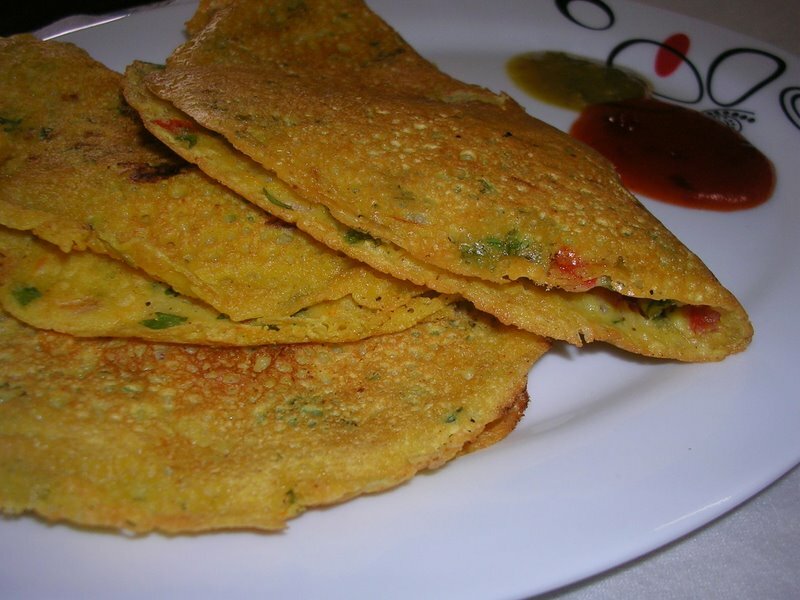 It looks healthy and delicious..I would love to try this.. How much besan did you use? Amar sosur Badi-r deshe...baper baDi giye khub maja korchho na? Punjabi famous dish baniye sabai ke khaochho? Really it is long time since I made PuDa...ami santiniketan aschhi..India phir-e ...tar par bangalore kothao dekha hoe jabe for sure ...bhalo theko. Hi Sayantani - enjoy your break! Lucky you! I'm sure your son is even more thrilled with the constant attentiona nd fussing all around him =). Not sure if its just me, but do you have an approximate quantity of besan flour that you used? And also, do you toast the flour before you used it? Thx! Can sense ur enjoyment and joy thro' ur write-up. There is no place like 'ma ka ghar' and enjoy the pampering. These are precious moments of ur life, enjoy. Loved the dish,full of goodness. love cheelas any day :0 and it's a great recipe to experiment on ..
We call this Cheela - Tomato Omlete , never added carrots and beans , will try next time. ohh so sorry. while editing the HTML the main ingredient Besan got missing. have updates the post. sorry for the Inconvenince. Thanks for pointing this out. @Ann. no I dont dry roast the besan, just used the normal store bought quality. O baba eki, tomar cheela ta dekhe khete icche korche. 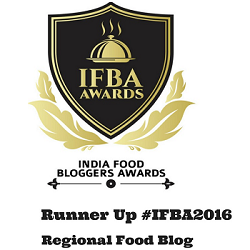 Enjoy your baper badir stay and once you're back in Bangalore, I'll be there to get the taste from your kitchen. Anyway amrao besan er cheela praye banai. Cheela looks delicious. very quick and yummy recipe. Hope I could go to my Mom`s place soon and I happy that you are having a nice time. The pancake seems to be an easy breakfast. I prefer breakfast that is not sweet and would definitely give this a try. I love dosas/uthapams. Nice one Saya. Hope you are getting pampered at home! Saw your comment at deepas..I envy you now, I get to go home once a year! 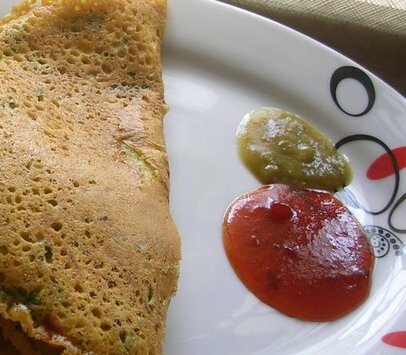 Pancake looks so tempting with those chutney .I feel hungry after seeing those pictures .I am also leaving for my mother's place for a week, so will take a break from blogging.What u say is right.We can come back refreshed and energetic after staying in our mom's place . love your besan ka cheela, Sayantani! i know the excitment of your first bread baking :) Have fun at your parents place! ki shundor dekhte lachey! like a lace. I always make mung dal cheela, besan diye kono korini. Enjoy ur stay and get pampered! The cheela looks yum, never made with besan! Hey Sayantani ,Good to see You back..after a refreshing break...I can relate to this post..I do the same when I visit my parents in MUmbai.. The kids are pampered by them..and I myself become a kid..just lazing around and enjoying the goodness.. LOve this besan ka Cheela. I make it too..But I like ur healthier version of adding grated carrots and beans. Awesome and tempting clicks. Enjoy your stay with your mom! tumaar eto shondor rokomari ranna, ama ke mogdho kore feleche ..enjoy your stay at your parents place. wow, these looks so savory. 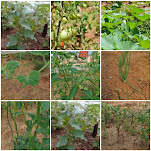 yummy clicks..
its seems you had a great time at your mum's place..bask in it dear now.. 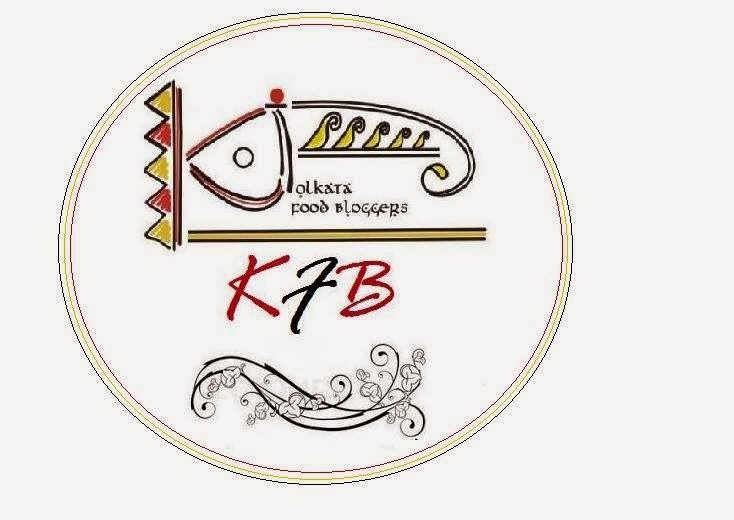 I will b exploring ur blog next.. and chk for all the lovely bengali recipes..
Besan ka cheela sounds very fulfilling. so you are having a great time at baper bari....khoob anondo..
the besan cheela is a fave at our place too n we call it besan poora or pooda. hey these looks so good..love the clicks..makes me hungry now.. This is my favorite too.Perfect for the event! enjoy the relaxing days :) shubho naba borsho to you and your family! Shubho Naboborsher shubhechcha Sayantani. Mayer bari te khub maja koro, onader o amar pronam janiyo. Oh I can see me in you when I am at my mom's place.I do the same thing within having to bother about anything .. Nothing can beat this pleasure. 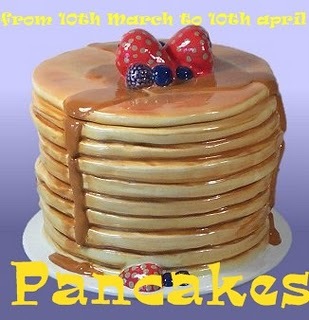 Pancake looks superb .. I wonder how got it crispy ..
@Monlisa, thanks for trying this. am glad that you liked it.